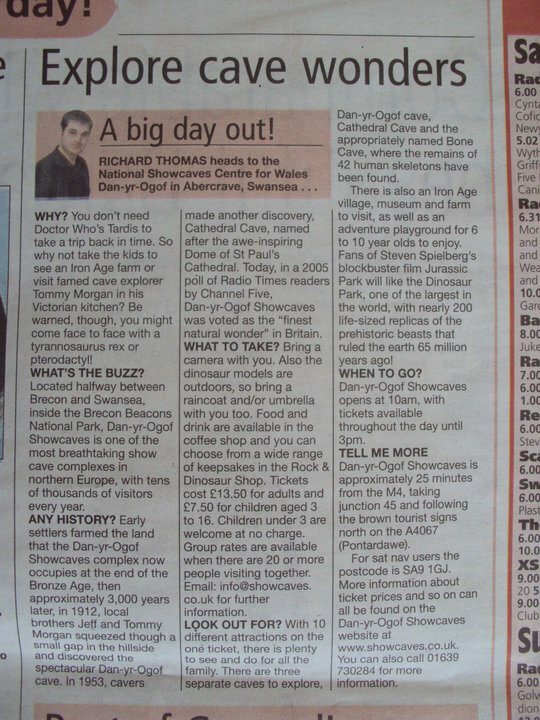 Below is my “Big Day Out” column from the Saturday, May 28, 2011, Swansea edition of the South Wales Evening Post. the Vue Cinema in Swansea. With the summer blockbusters just around the corner there are lots of films coming out soon at the Vue. The Vue is a new state-of-the-art cinema located on York Street, in the centre of Swansea. With 12 screens the cinema can seat up to 1,762 people and is equipped with all the latest facilities you would expect of a modern cinema. These include wall-to-wall screens and digital projectors, enabling filmgoers to experience all the latest ground breaking 3D animation! The Vue also benefits from a speed bar where you can kick back with a beer before your film starts. There’s even a Ben and Jerry's ice cream counter for the kids! The Vue only opened in 2006 but there is a long history of film going in Swansea. In 1914 Wales' first purpose built cinema, the Carlton Cinema de Luxe, opened in the city. Situated on Swansea’s Oxford Street, the Carlton was closed by the Rank Organisation in 1977, and is now home to a Waterstones bookshop. During the weekend tickets cost £7.15 for adults (19 and over) and £5.30 for children (2-12) and £5.65 for teenagers (13-18). Tickets for students with a valid photo ID only cost £6.05. There are lots of discounts available. If you’re a family of four with two children you can even opt to buy a family ticket where everyone pays child prices! More information about ticket prices and family discounts can all be found on the Vue Cinema Swansea website at http://new.myvue.com/home/cinema/swansea. Completing your cinema experience a wide variety of snacks including popcorn, hot dogs, nachos, sweets and soft drinks are all available at the cinema’s snacks counter. Combos are available to save a little money. Two films out now suitable for all the family are Rio from the makers of Ice Age about a pet macaw who decides to fly the coop and head to Rio de Janeiro and Mars Needs Moms about a stroppy son whose mum is abducted by aliens and taken to the planet Mars. Both these films are available in stunning 3D! Scream 4 is out for older audiences. The first film in the popular horror franchise in over ten years! Woodsboro’s infamous masked killer is back. And he's got some making up to do! The Vue is open Monday to Saturday, 9.00am to 5.00pm. On Sundays the cinema is open from 10.00am to 4.00pm. Their address is: Vue Cinema Swansea, York Street, Swansea, SA1 3LZ. For film start times and to book tickets you can phone on 08712 240 240 or visit the official Vue Cinema website at www.myvue.com. 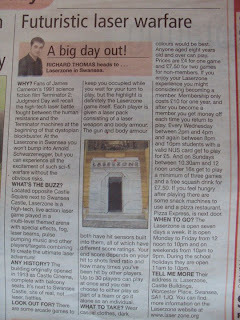 Below is my “Big Day Out” column from the Saturday, May 21, 2011, Swansea edition of the South Wales Evening Post. Fans of James Cameron’s 1991 science fiction film Terminator 2: Judgment Day will recall the high-tech laser battle fought between the human resistance and the Terminator machines at the beginning of that dystopian blockbuster. At the Laserzone in Swansea you won’t bump into Arnold Schwarzenegger, but you can experience all the excitement of such sci-fi warfare without the obvious risks. Located opposite Castle Square next to Swansea Castle, Laserzone is a high-tech, live action laser game played in a multi-level themed arena with special effects, fog, laser beams, pulse pumping music and other players/targets combining to create the ultimate laser adventure! Not really. But some might think it ironic that the Laserzone is situated next door to the ruins of Swansea Castle, a place where real life battles once took place back in history. There are some arcade games to keep you occupied while you wait for your turn to play, but the highlight is definitely the Laserzone game itself. Each player is given a laser pack consisting of a laser weapon and body armour. The gun and body armour both have hit sensors built into them, all of which have different score ratings. Your end score depends on your hit to shots fired ratio and how many times you’ve been hit by other players. Up to 30 players can play at once and you can choose to either play as part of a team or go it alone as an individual. Wear casual clothes, dark colours would be best. Anyone aged eight years old and over can play. Prices are £4.00 for one game and £7.50 for two games for non-members. If you enjoy your Laserzone experience you might considering becoming a member. Membership only costs £10.00 for one year, and after you become a member you get money off each time you return to play. Also every Wednesday between 2.00pm and 4.00pm and again between 8.00pm and 10.00pm students with a valid NUS card get to play for £5.00. And on Sundays between 10.30am and 12.00pm under 16’s get to play a minimum of 3 games and a free squash drink for £7.50. If you feel hungry after playing there are some snack machines to use and a pizza restaurant, Pizza Express, is just next door. The Laserzone is open seven days a week. It is open Monday to Friday from 12.00pm to 10.00pm and on weekends from 10.00am to 9.00pm. During the school holidays they are open 11.00am to 10.00pm. Their address is: Laserzone, Castle Buildings, Worcester Place, Swansea, SA1 1JQ. You can find up to date information about game prices etc. on the Laserzone website at www.laserzone.org or call on 01792 653433. 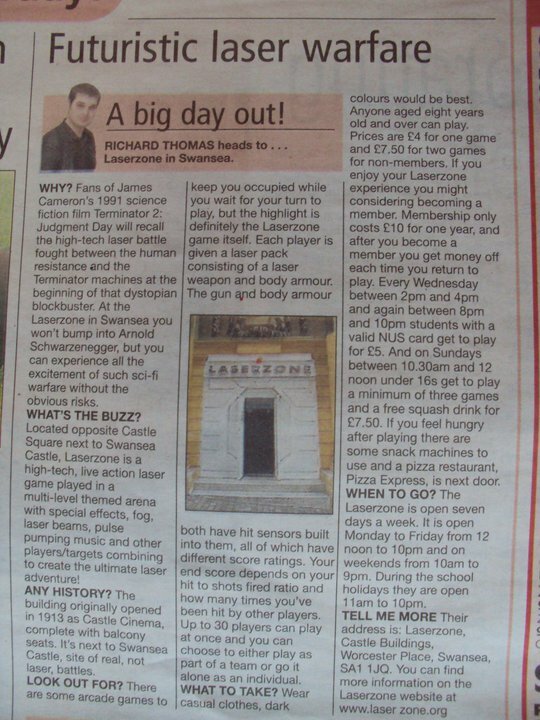 Below is my “Big Day Out” column from the Saturday, May 14, 2011, Swansea edition of the South Wales Evening Post. Stretching 225 meters out into Mumbles Bay, Mumbles Pier in Swansea offers visitors some of the most spectacular views of natural beauty in Wales. From The Pier you can see the breathtaking scenery of Mumbles Bay, Mumbles Lighthouse and Port Talbot. Mumbles Pier is situated in Mumbles five miles from the centre of Swansea. One of Wales’ last Victorian piers, Mumbles Pier is still a popular fishing point. The land beside The Pier is now an entertainment complex comprising bars, a restaurant, and ice-skating rink. The Pier even has its own amusements arcade, so there’s something for all the family to enjoy other than just the impressive view and fishing. Designed by W. Sutcliffe Marsh, Mumbles Pier first opened in 1898. The Victorian built attraction was once the only way to visit Swansea in style. The White Funnel paddle steamers of P and A Campbell would dock on the end unloading tourists who would then make their journey via the Swansea and Mumbles Railway, the world’s first passenger railway. In recent years, however, The Pier has fallen into a state of disrepair with a large section fenced off to visitors and other areas patched up to maintain safety. Readers interested in the plans to redevelop Mumbles Pier should visit www.mumblespierdevelopment.com. Remember to bring a camera with you to take some snaps. There is a small charge of 50p to enter Mumbles Pier itself, and if you plan on doing some fishing it costs £3.00 per rod. Food and drink are available in The Pier’s café. The Pier also has its own pub. Although the glory days of the old White Funnel steamers that once delivered thousands of tourists to Mumbles and Swansea are long gone, Mumbles Pier still has plenty to offer visitors. The panoramic view of Swansea and Mumbles from The Pier is well known throughout the UK, attracting tourists from across the country. In the amusements arcade you can try your luck at the slot machines while the children play all the latest video games. There’s also ten pen bowling and an array of prizes to be won on the cranes. The bright and airy space has something for everyone. And afterwards you can enjoy fish and chips in The Pier’s café. Before you head back home, though, be sure to check out Mumbles Lifeboat Station, the third busiest station in Wales, where a Tyne class lifeboat and a IB1 class lifeboat are operated. Mumbles Pier is open seven days a week, 9.00am to 8.00pm. For the opening times of the Pier’s café, pub and amusements arcade you can visit the official Mumbles Pier website at www.mumbles-pier.co.uk. Their address is: Amusement Equipment Co Ltd, Old Lifeboat Cottage, Mumbles Road, Mumbles, Swansea, SA3 4EN. For more information about The Pier you can email arcade@ameco.co.uk or call on 01792 365220. 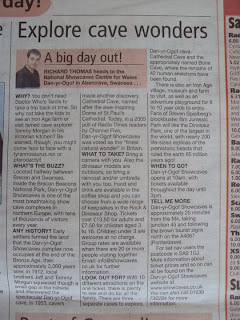 Below is my “Big Day Out” column from the Saturday, May 7, 2011, Swansea edition of the South Wales Evening Post. You don’t need Doctor Who's Tardis to take a trip back in time. So why not take the kids to see an Iron Age farm or visit famed cave explorer Tommy Morgan in his Victorian kitchen? Be warned, though, you might come face to face with tyrannosaurus rex or pterodactyl! Located halfway between Brecon and Swansea, inside the Brecon Beacons National Park, Dan-yr-Ogof Showcaves is one of the most breathtaking show cave complexes in northern Europe, with tens of thousands of visitors every year. Early settlers farmed the land that the Dan-yr-Ogof Showcaves complex now occupies at the end of the Bronze Age, then approximately 3,000 years later, in 1912, local brothers Jeff and Tommy Morgan squeezed though a small gap in the hillside and discovered the spectacular Dan-yr-Ogof cave. In 1953, cavers made another discovery, Cathedral Cave, named after the awe-inspiring Dome of St Paul’s Cathedral. Today, in a 2005 poll of Radio Times readers by Channel Five, Dan-yr-Ogof Showcaves was voted as the "finest natural wonder” in Britain. With 10 different attractions on the one ticket there is plenty to see and do for all the family. There are three separate caves to explore, Dan-yr-Ogof cave, Cathedral Cave, and the appropriately named Bone Cave, where the remains of 42 human skeletons have been found. There is also an Iron Age village, museum, and farm to visit, as well as an adventure playground for 6-10 year olds to enjoy. Fans of Steven Spielberg’s blockbuster film Jurassic Park will like the Dinosaur Park, one of the largest in the world, with nearly 200 life-sized replicas of the prehistoric beasts that ruled the earth 65 million years ago! Bring a camera with you. Also the dinosaur models are outdoors, so bring a raincoat and/or umbrella with you too. Food and drink are available in the Coffee Shop and you can choose from a wide range of keepsakes in Rock & Dinosaur Shop. Tickets cost £13.50 for adults and £7.50 for children ages 3-16, children under three years old are welcome at no charge. Group rates are available when there are 20 or more people visiting together. Email: info@showcaves.co.uk for further information. Dan-yr-Ogof Showcaves will be open for the duration of the February half term week. They open at 10.00am, with tickets available throughout the day until 3.00pm. Dan-yr-Ogof Showcaves is approximately 25 minuets from the M4, taking junction 45 and following the brown tourist signs north on the A4067 (Pontardawe). For sat nav users their postcode is SA9 1GJ. More information about ticket prices etc. can all be found on the Dan-yr-Ogof Showcaves website at www.showcaves.co.uk. You can also call on 01639 730284.